My review is for the NDG - as the ODG has another page here. The NDG was our board for the night. Nice hotel, good service and excellent food/breakfast. For drinkers, there is a hikers bar that's unpretentious . Two real ales were on - Wainwright and a never seen before and little information found on the web Hardy Tup. It does appear as though I have been accidentally been drinking mild again. Great location and good beer. 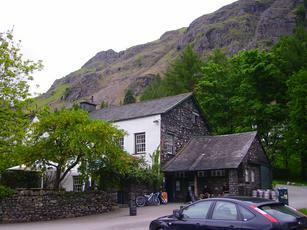 The pub in the pictures is the Old Dungeon Ghyll, half a mile up the road. Went to the Old Dungeon Ghyll Hikers bar after a long walk. Nice to find a few real ales on handpull. A classic old fashioned bar,no fancy frills,just a nice friendly place to sit and enjoy a beer after a long days walking. The ale was served and kept well,had some Cumberland ale,have to say its the best one ive had in a while,other pubs havent kept it right,also had a nice pint of Theakstons XB which went down nicely. The bar staff were friendly and happy to have crack and the lad was very knowledgeable about his ales.The outside was pleasant as well with several tables to sit and enjoy a scenic area. Shame I had to get the bus back to Ambleside at 4.15 as I couldve stayed and drank all evening. 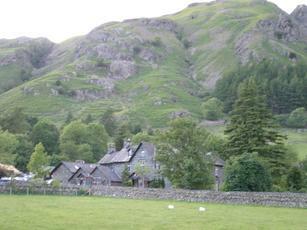 Look forward to returning when I am in Langdale again. ALL your pictures are of The Old Dungeon Ghyll Hotel - this review is for the Old Dungeon Ghyll Hotel and subsequent to that will be a review for the New Dungeon Ghyll Hotel which as ciderchap advised is further (walkable distance) down the road near Elterwater, likewise the Sticklebarn. 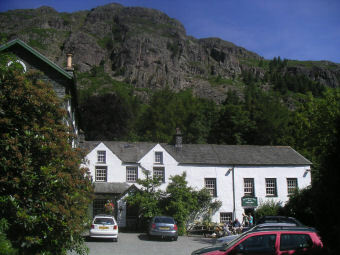 I will upload a picture of the New Dungeon Ghyll Hotel and the rating is for the same. Old Dungeon Ghyll Hotel: enjoyed a Yates Best and 3 of Moorhouse Black Cat - all beer was excellent in particular the Black Cat. Ate here as well, adequate. 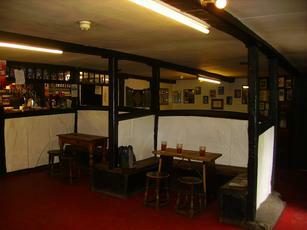 Friendly atmosphere - an enjoyable pub, to tired to get lashed. About �2.60 a pint. New Dungeon Ghyll Hotel: enjoyed 2 beers here Thwaites Wainright and Cumberlands Corby Ale - both were very good, in particular the Wainright. The Corby Ale is produced by a small brewery from Carlisle called 'Cumberland' and is not to be confused with 'Jennings'. Also ate here, had the homemdade chicken and leek pie with fresh veg, gravy and chips - it was excellent (the pie) and at �10.95 with a Wainright thrown in is reasonable for the location. The pie on it's own was �9.50 and the Wainright �3.15...which is a tad steep. In summary - both Dungeon Ghylls (old and new) are worth a visit. The staff in both establishments are overworked and no doubt underpaid. This reveiw is for the OLD dungeon Ghyll(ODG) hotel, the refrences and picture are of the Odg. Top pub, the walkers bar is what it says on the door - for walkers , 2 legged and four all made very welcome, reasonably priced and generous portions of food in probally the best location for a pub in the lake district. Beer is great especialy the black sheep bitter and the conniston bluebird. Walk and crawl back and forth from here and the stickle barn and you wont go far wrong.